SkyRun is an award-winning company that has been recognized for quality, growth and having some of the happiest property owners and guests around. Value. Before, during and after your vacation, you’ll feel that every penny of your money was well-spent and the perks were icing on the cake. Local touch. With the advice of your vacation host, you’ll experience your destination in ways that you would otherwise never have known. Fun. Your vacation will be a time of relaxation, entertainment, discovery and escape. Book Your Estes Park Vacation Today! We’re so pleased you’ve chosen beautiful Estes Park for your vacation or getaway — base camp for Rocky Mountain National Park. For over 100 years, this vibrant mountain village has offered high altitude fun for all the seasons. In summer, you’ll find that Estes Park is the BEST playground in the Rockies and truly your resource for adventure. There are miles and miles of hiking trails, great golf and fishing plus fantastic opportunities to see amazing wildlife. There are more fun and games at our many adventure parks and endless shopping throughout the village. During the evening you’ll have your pick of toe-tapping live music at many of our scrumptious eateries, craft breweries or distilleries each night near downtown Estes Park. 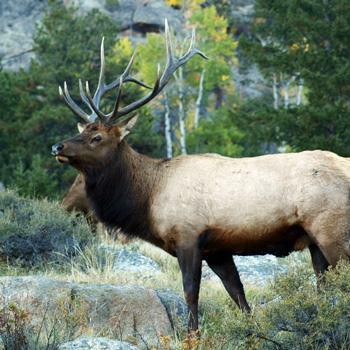 Elk bugling, the most glorious golden leaves and numerous festivals! You don’t want to miss autumn in Estes Park. In winter we are easy to get to — no mountain passes or 3 hour traffic jams block your way to a snowy wilderness adventure. You can snowshoe or cross country ski in the National Park or Forest. Relaxing by a cozy fireplace with a good book or family sledding at Hidden Valley is always a great winter option. Live music and candlelight dinners abound! Search through our Holiday Deals to save 10-20% during: Veterans Day, Thanksgiving and Christmas Holidays. Click HERE to learn more. And don't forget to check back often for future promotions! Enter your vacation dates and find your vacation retreat or call 970-235-5550 or 844-SKYRUN-8.